Genre: Jazzy, beatnick lounge songs. About pirates. It may surprise you to learn, I listen to a LOT of pirate music (far more than I’ve yet reviewed, shamefully.) As such, I’m rarely truly surprised. Impressed, certainly – it’s always a treat to hear a new origninal song, or an exciting new presentation of an old song. And it’s always thrilling to learn of a new pirate-rock or pirate-shantey group picking up the torch and lending their talents to create truly original material. BUT, sometimes it feels like I’ve heard it all. Of course, I’m sometimes forced to eat those words with a song or two. And once in a great while, an entire album comes out that is so new and original that it sideswipes me right off the deck. 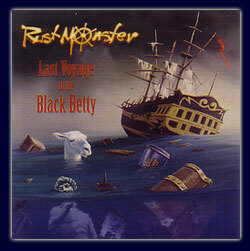 “Last Voyage of the Black Betty” is one such album. 1. Act I: The Impression of Crew: Piratey spoken word over the backdrop of tavern chatting and squeezebox. Set as intoductory piece of main players in the Black Betty story. 2. Bosun’s Song: Awsome jazzy start. Piratey vocals over brass and drums. Wildly fun and catchy. 3. Black Betty: A lesser song. Still somewhat catchy, but the piratey feel is more understated. 4. Ho, to the Lady: Not sure what to make of this one – falsetto vocals and nautical pirate references. Trombones. 5. The Young Sea Officer’s Sheet Anchor: More than any other song, this track sums up the album. The music is the sort you would hear in any jazz club – rythm guitar and saxaphone and such. The lead vocals are spoken word – a piratey voice reading from the Young Officer’s Sheet Anchor (essentially the equivelant of an 18th century technical manual for sailors) verbatum. And it’s absolutely awsome! Fun to listen to, and funny as all hell. Beatnick piracy. 6. Act II: The Fall of Halmstad: Another spoken piece, driving the story of the Black Betty forward. Piratey vocals over battle sounds and squeezebox. 7. Kill Them Till They’re Dead: A bit of a garage-band detour, but still piratey to the core. Drums and guitars to rough pirate threats and battle talk. 8. Bucket Boy: Without a doubt, the weirdest song on the album. I adore it, find it hilarious, and worry that this might be a sign of my own mental instability. The song features two tones, spliced back and forth throughout, and the contrast is brilliant. One set of vocals is slow and scratchy, and sings of the plight of the ship’s bucketboy. It’s full of references to hard work and sucky days. The other set of vocals is happy and perky, and reflects the bucketboys eternally chipper attitude as he escapes his lousy workaday life and retreats into his own head. It’s peppy and intentionally simplistic, dopey and freaky. And, as stated, it’s weirdly hilarious. 10. The Hempen Jig: Again, another jazzy sort of song, this time featuring a variety of pirates singing of their shipmates life – from child to adult scoundrel – as he slowly works his ways to the gallows. A highly original song with in which the humorous tone of the music is offset by the sad sentiment of the subject matter. Definitely one of the several tracks on this album that demostrates real genius in both concept and execution demostrate some real genius. 11. Rowing Down the River of Men: A fast paced tune in which the lyrics quickly summarize the fates of several historical pirates (Stede Bonnet, Anne Bonney, and Captain Kidd.) The only part I can’t figure is the refrain, which – like the title – is simple a repeated “Rowing down the river of men,” which seems to reflect the final doom of the aforementioned scoundrels. I’m not sure how the gallows equate to a river of men, but it remains a catchy tune. 12. Act III: The Destiny of the Black Betty: The final spoken word segment, detailing the Black Betty’s final fate. The Last Voyage of the Black Betty is a wonderful album of unrestrained genius. Shanty purists will find little of interest, but those who’s love of piracy goes beyond the historical will find this a CD filled with piratey fun of a truly unique nature. This has quickly become one of the albums I can’t imagine being without, and to my mind Rustmonster has secured itself a place amongst the highest echelon of pirate-themed non-traditional artists, right alongside such esteemed bands as Captain Bogg & Salty and Captain Dan and the Scurvy Crew. This entry was posted in Music and tagged alternative, bilgemunky's favorites, funk, jazz, pirate-core, rustmonster by Bilgemunky. Bookmark the permalink.